Following the latest trends in the crowdfunding industry, the Starbase project focuses on creating a token-based crowdfunding and crowdsourcing platform built on the Ethereum blockchain. Though some details of the project may be vague, the idea behind it is simple – the goal is to allow everyone to easily create or support projects designed to provide new services and products. We have to admit that we were not particularly impressed by this project at first glance, but we still decided to give it a look, check out the details of its ICO, and report our findings in this Starbase review. Our experience has taught us not to judge a project by the number of people behind it, although a large team does tend to inspire more trust. In the case of the Starbase project, there are only 4 team members. The founder of Starbase is Tomoaki Sato, a blockchain engineer. Other team members include Yu Yamanaka, the CTO, Ernane Luis, front-end engineer, and Gustavo Guimaraes, full-stack engineer. The names may not ring a bell, as the enthusiastic people behind Starbase are mostly just making a name for themselves in this business. Starbase also has several advisors lending a helping hand in the development of the project. Its advisors are Eric Gu, the founder of Viewfin, Darvin Kurniawan, the founder of REIDAO, Chandler Guo, angel investor, Dominic Williams, chief scientist at DFINITY Stiftung and the president/CTO at String Labs, and Hideyuki Takeuchi, technology advisor and the CTO at Uzabase Inc.
As suggested before in this Starbase review, the platform is designed to serve for crowdfunding and crowdsourcing startups. The goal is to allow project creators without any blockchain knowledge to benefit from the use of this advanced technology. The Starbase platform allows everyone who wishes to create a project to easily issue ERC20-type tokens and use them to raise funds or give tokens as work payment or long-term incentive. It also provides the infrastructure necessary for supporters to be able to purchase tokens or work on the project and consequently receive tokens as a long-term incentive. The native cryptocurrency of the platform, Star token, is described as a consumable, inflationary, and rewardable token. Consumable means that the token can be exchanged for services and products through the Starbase platform. Rewardable means that the token holders can receive rewards from the project creators, with the rewards paid from project revenue. The rewards can be paid in Ether, Star or any project token. Inflationary means that more tokens can be released after the crowdsale. Every time a token is issued, initially sold or used for outsourcing labor work, a small percentage fee is charged. All the fees are distributed to the Star token holders through the Starbase platform reward mechanism. Starbase promises to offer great benefits to both project creators and contributors. Its aim is to offer project creators a fast and affordable way to share flexible long-term incentives with all team members. It allows for global fundraising with the use of the most popular cryptocurrencies, including Bitcoin and Ether. It also allows for global connections with all kinds of professionals who can be hired to work on the project. As far as contributors are concerned, they can support the projects they find interesting and get tokens in return. The more successful the project becomes, the higher the value of the tokens, so both the project creators and the contributors can benefit from the support received and provided. The platform also provides complete transparency, with all details publicly verifiable on the blockchain, which results in higher liquidity for trading on exchanges. Starbase also promises quarterly rewards distributed to Star token holders. Basically, what Starbase aims to provide is easier and faster project funding, great incentives for contributors, excellent rewards for Star token holders, and global access to the platform. The Starbase ICO is set to begin on July 30, 2017. It will last for 45 days and the goal is to raise $2.5 million. If this amount is not raised during the first 45 days of the crowdsale, the token sale will be extended and immediately terminated once the target amount is reached. The minimum amount that needs to be raised in order for Starbase to commence operations is $1 million. According to the Starbase whitepaper, the raised funds will be used for 4 distinct purposes. Out of the total amount, 50% to 75% will go into the development of the platform, 20% to 45% will go into business development, including marketing, sales, and consulting, 10% to 25% will be used to cover the legal costs while 5% to 10% of the funds will be set aside for contingency purposes. We may be nitpicking, but we prefer concrete figures instead of ranges and we are not exactly sure how the above-mentioned figures add up. The plan is to initially issue 1 billion Star tokens, with 12.5% (125 million) offered up for sale during the ICO. Out of the remaining 875 million Star tokens, 450 million tokens will be hard-locked and 300 million tokens will never be transferable, all of which will remain in control of the Starbase company. The rest of the tokens will go to the founders and early contributors (62.5 million), bounty campaign participants (12.5 million), and into bonuses for early purchasers (50 million). During the Starbase ICO, investors will be able to purchase Star tokens by paying in either Ether or Bitcoin. The minimum purchase amount is truly the bare minimum – the amount invested should not be lower than or equal to the transaction fees on Bitcoin and Ethereum networks (around $0.1). 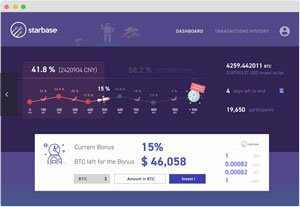 Starbase plans to offer bonuses during the first 42 days of the crowdsale. During the first 7 days, investors will receive 20% bonuses. Between the 8th and the 21st day of the crowdsale, they will receive 15% bonuses, between the 22nd and the 35th day, they will get 10% bonuses, and between the 36th and the 42nd day of the crowdsale, 5% bonuses will be given. In case the duration of the ICO is extended, more bonuses will be available (46th-48th day: 20% bonus, 49th-51st day: 15% bonus, 52nd-54th day: 10% bonus, and 55th-57th day: 5% bonus). Crypto Coins’ YouTube review introduces the Starbase project and its ICO, providing details about Star tokens, the team behind the project, Starbase partnerships, etc. The video also lists the project’s advantages and disadvantages. The official Starbase YouTube channel can help you figure out how the platform works. In the videos, you can also learn everything you need to know about Star tokens. The Starbase platform is presented as a completely innovative project, although it closely resembles several other crowdfunding platforms recently created. We are hardly convinced that it is a unique investment opportunity, as when it comes to the whitepaper and the entire site, vagueness abounds. Moreover, we have not found enough concrete data to inspire belief in the bright future of the project. We are by no means saying that Starbase is not worth giving a look. However, what we are saying is that based on the information provided, we cannot say with any certainty that investing in this platform is a good idea.